We hope you’ve been having a very happy holidays. 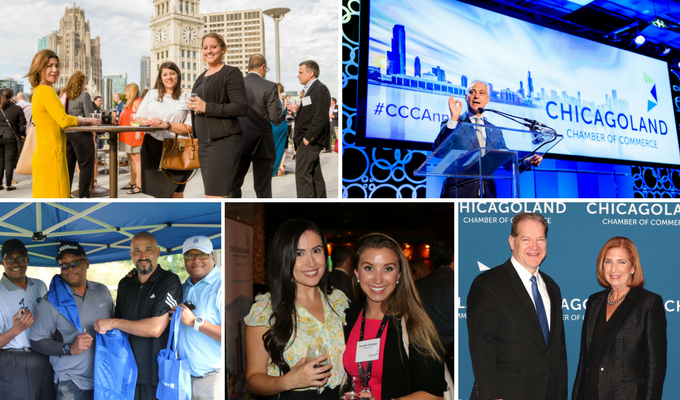 It has been our pleasure working with you in 2017 to maximize business opportunities and drive the Chicago region’s economy. Our online photo albums have event highlights from throughout the year. We look forward to a continued partnership, and a prosperous 2018! VIP EXPERIENCES AT SUPER BOWL 52: NFL on Location is offering Chicagoland Chamber members and friends access to game tickets, travel packages and VIP experiences at Super Bowl 52 in Minneapolis. Includes parties, concerts, in-stadium club, and going on-field. One-stop planning. A once in a lifetime experience! - Turn business-related New Year’s resolutions into action at Wright Living's workshop where you'll learn how to set and reach achieveable goals. - Alfred Benesch & Company just moved to a new location. - The Chicago Bulls are offering Chamber members special ticket prices on two games in January. - Tripp-Lite is seeking additional talent to support continued profitable growth. - The Museum of Contemporary Art's new restaurant, Marisol, made Chicago Magazine's December "Hot List". - No need to travel far for a great trip. Here are Chicago's best staycation ideas, featuring members Palmer House Hilton and Loews Chicago Hotel. - The 2018 100 Best Dishes and Drinks in Chicago include members Kaiser Tiger, MCA Chicago's Marisol, Waldorf Astoria's Margeaux Brasserie, and The Gwen. We thank the sponsor of this newsletter, Sprint, for its membership and support of the Chamber, and for creating products customized for the Chicago region’s business community.